The French for to universalise is the regular ER verb universaliser. To remember this, imagine a universalised view of the world in the French colours! - universel / universelle (adj): universal (m/f). - l'univers (nm): universe; world. Cartoon Memory Triggers. Think of the word, think of the pic! universalise! universalise ! universalisons ! universalisez ! ✔ Universaliser is a regular ER verb. There are over 5,000 ER verbs these being the most common verbs in French. ✔ Learn universaliser and it will reinforce the pattern for ALL those other ER verbs. ✔ You can more easily remember words and verbs like the French verb universaliser - French for universalise - using the techniques of the world's Memory Masters. 200 Words a Day! 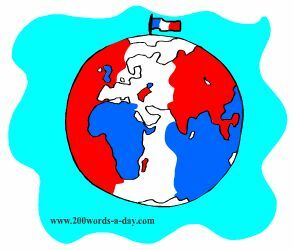 Free Daily French Lesson Online - the French verb universaliser - fully conjugated. French Learning Made Fun and Fast with your free Daily French Verb Lesson - universaliser.